15.24 m (50-ft.) mini-stereo dubbing cord commonly used with multimedia speakers and other audio devices. 3.5mm stereo male to male connectors. With Tripp Lite’s P312-050, you can establish a high-quality audio connection for devices equipped with standard portable headphone jacks. 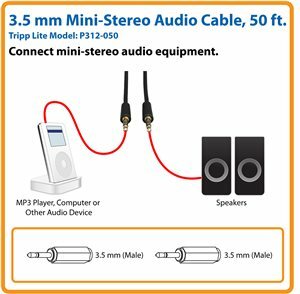 This 50 ft. Mini-Stereo Audio Cable features two 3.5 mm male connectors that fit most portable audio devices, including iPods, iPhones, iPads, Android devices and MP3 players. The P312-050 also establishes audio connections with PCs, receivers, microphones, sound cards and any other audio device equipped with a 3.5 mm jack. Simply insert the male connectors into the audio source and output for high-fidelity sound. Manufactured using only top-quality materials, the P312-050 has gold-plated connectors to ensure excellent conductivity with minimal signal loss and optimal clarity. Single-piece, molded construction offers durability and long life. For peace of mind, this cable is backed by a lifetime warranty. It’s also manufactured in compliance with strict RoHS specifications, reflecting Tripp Lite’s commitment to environmental responsibility. P312-050 3.5 mm Mini-Stereo Audio Cable (M/M), 50 ft.